Priya and Abhi are so excited to be celebrating this amazing milestone in their lives at the brand new TRS Coral and Grand Palladium Costa Mujeres Resort & Spa! Get ready to enjoy the stunning tropical views, private white sand beaches, crystal clear water, and incredible hospitality. 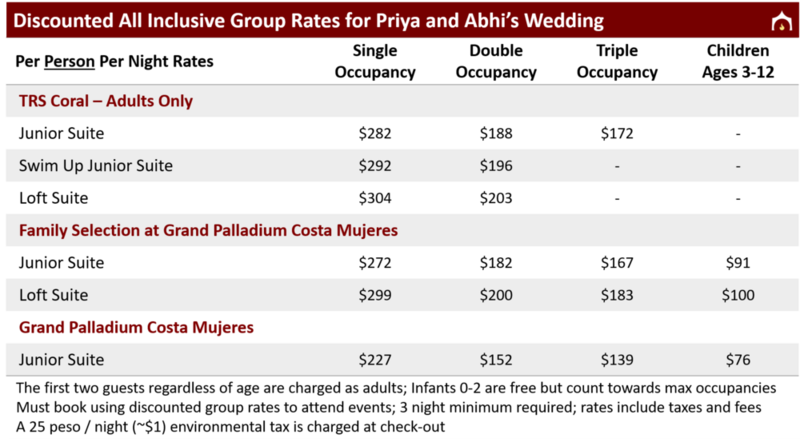 Priya and Abhi have secured discounted group rates for guests of their wedding! Reservations MUST be made on this site through Shaadi Destinations to attend wedding events; reservations made directly with the resort, via online travel agencies such as Expedia or Hotels.com, or via a travel agency will not receive any group perks, discounted group pricing, and promotions nor will guests be allowed to enter wedding events. 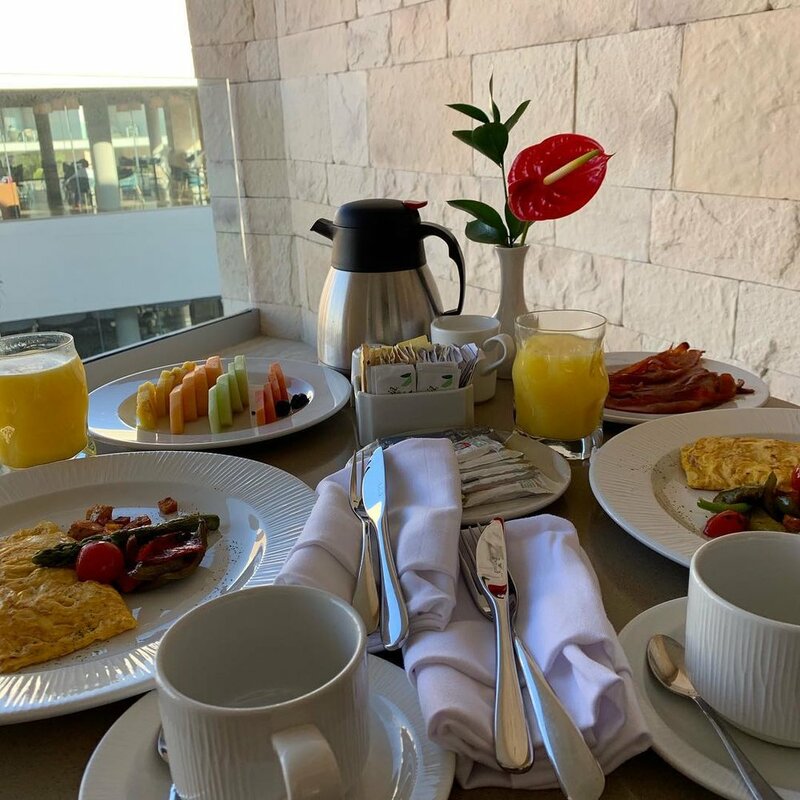 Discounted room rates are held for guests from July 2-10, 2019 for those who wish to extend their time in paradise. Reservations can be made until April 25th, but please make your reservation by March 15th so we can plan for your attendance of events. The brand new TRS Coral and Grand Palladium Costa Mujeres Resort & Spa is a bright and stylish 5-star beachfront hotel located in a privileged spot of the Mexican Caribbean. 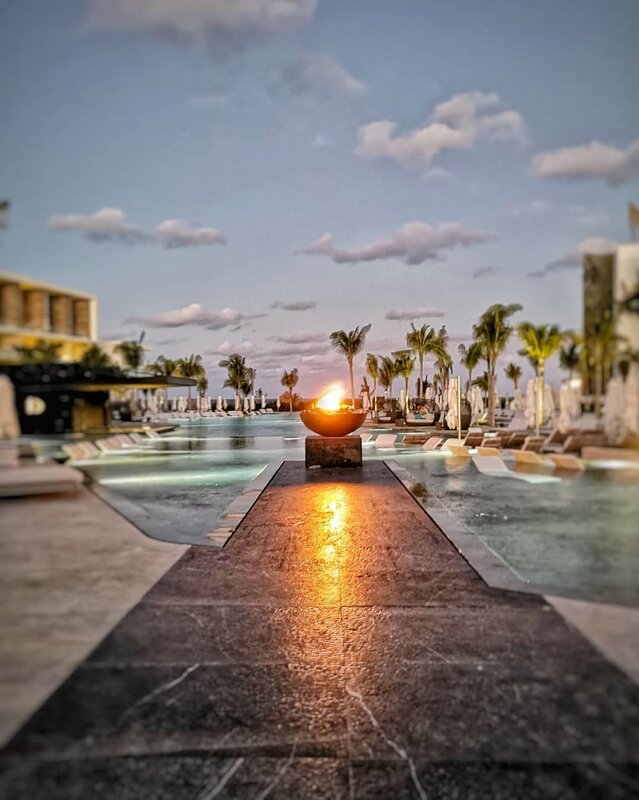 From its crystalline shores and pleasant waters to nearby ancient Mayan ruins, TRS Coral and Grand Palladium Costa Mujeres Resort & Spa offers guests the opportunity to discover the true spirit of Mexico with 5-star treatment. 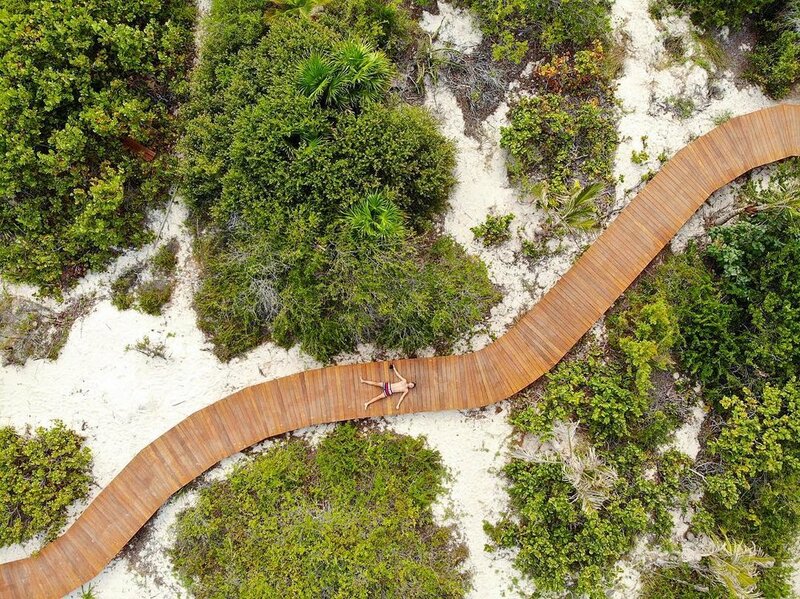 While its arresting modern architecture distinguishes it from the surrounding mangroves, the hotel is built with eco-friendly materials, ensuring minimal environmental impact and further elevating its beachfront appeal. At the heart of TRS Coral and Grand Palladium Costa Mujeres Resort & Spa is its village zone, a bustling hub with à la carte restaurants and outstanding services. The hotel’s beautifully furnished rooms are kitted with memory foam mattresses, whirlpool bathtubs, and sofa-beds, ensuring guests remain relaxed and rejuvenated throughout their stay. Keep fit with a variety of beach-orientated activities such as snorkeling and kayaking, or enjoy professional tennis instruction through a variety of programs at the Rafa Nadal Tennis Centre. After an invigorating massage, order a glass of bubbles at Bar Champagne before taking a refreshing dip in the main pool and savouring traditional Mexican cuisine for dinner at La Adelita restaurant or authentic Indian cuisine at Bhogali restaurant. Choose from 7 à la carte restaurants, 2 show cooking restaurants, and 15 bars, including an Xtra Time Sports Bar. Soak the day away in your choice of 4 freshwater swimming pools. TRS Coral is an Adults-Only (18+) paradise within the Grand Palladium resort and the FIRST resort to ever receive the elite designation of being a 'Leading Hotels of the World' before even opening. An Adult-Only haven, expect pure luxury treatment and be pampered with access to exclusive TRS amenities, restaurants, a pool, a rooftop lounge, the hydrotherapy sections of the Zentropia Spa, and more! Even more exciting, TRS guests get access to Chic Cabaret - a broadway style dinner show that has rave reviews! Family Selection at Grand Palladium Costa Mujeres is the perfect fit for families that still want premium access, exclusivity, and rooms! It offers exclusive facilities and personalized services for the entire family, situated in a privileged area of the resort, so that both parents and their little ones can enjoy their vacation to the fullest. Parents can cross-over to TRS to enjoy the Adults-Only sections while children get Family Boss classification, which provides children with special amenities, services and facilities so that they can enjoy their vacation to its maximum extent. This includes surprises in room, milk and cookie service before bed time, mini bathrobes and slippers, fun zone with video games, cooking classes and arts and crafts activities. Grand Palladium Costa Mujeres is a great option for families that don’t want the extra attention or pampering available at TRS or Family Selection but still want an all-inclusive vacation. Adults staying at Grand Palladium will not be able to access adult-only sections at TRS Coral. While the primary resort for the weekend will be TRS Coral, all events will be child-friendly and held a few minute walk away at Grand Palladium Costa Mujeres. While there is a 3 night minimum, most guests choose to add nights at the discounted rate before and after the wedding in order to enjoy the incredible resort with friends and family. Please feel free to take advantage of this rate from Tuesday, July 2, 2019 - Wednesday, July 10, 2019. Travel to Mexico requires valid passports, even for US Citizens. Please ensure that your passport expires after January 2, 2020 (6 months from the date of entry into Mexico). Mexico has no visa requirement for US Citizens, but you will be asked to fill out a FMM form (Mexico's visitor permit) on the plane or once you land. Once you get to immigration and customs at Cancún airport, the agents will give you the bottom half to retain until you leave the country. It is VERY important to keep this secure until you leave Mexico. Priya and Abhi will be providing for transfers in Cancún! Please share flight information with Shaadi Destinations as soon as you have this available but not later than 1 month prior to travel. What time is check-in and check-out at TRS Coral and Grand Palladium Costa Mujeres? While most destination wedding guests choose to stay 3-6 nights when flying to Mexico, we understand there may be certain limiting factors. Unfortunately, group discounts are only valid on a minimum of 3 night stays. If you must stay 2 nights, please contact us at hello@shaadidestinations.com so we can find the best rates possible for you. Booking through Shaadi Destinations allows for certain group benefits to be conveyed and allows for the best rate possible. We chose Grand Palladium Costa Mujeres because of the endless list of activities that will turn us all to children - so children are encouraged! For toddlers, Grand Palladium's Baby Club was designed to meet the needs of children ages 1-3. For teens, the Teen Club is loaded with activities, video games, table sports, and more! Families are encouraged to stay at Family Selection, where children will have upgraded amenities and adults will also be able to partake in fun adults-only activities taking place at TRS.